A rarely seen original poster for Houdini's "Double Fold Death-Defying Water Mystery" is currently on display as part of an exhibition at the University of Sheffield's Western Bank Library in the UK. 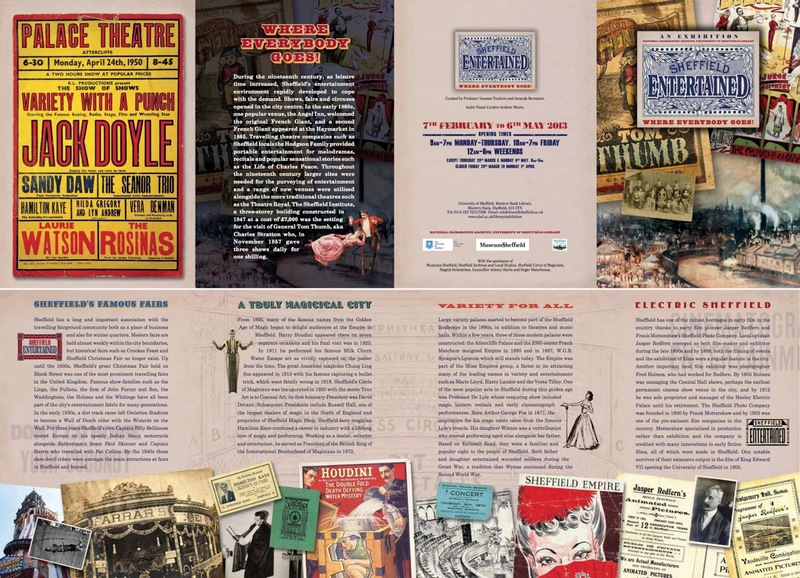 "Sheffield Entertained" covers 200 years of variety entertainment in the city, including the growth of music halls, the world of magic, early cinematograph shows and travelling funfairs. The exhibition is curated by Professor Vanessa Toulmin and Amanda Bernstein, with audio visual materials curated by Andrew Moore. Houdini appeared in Sheffield on seven separate occasions (according to exhibition materials). Houdini's final visit to the city was in 1920. This poster is dated to a 1911 appearance and belongs to the Museums Sheffield who lent it to the exhibition. 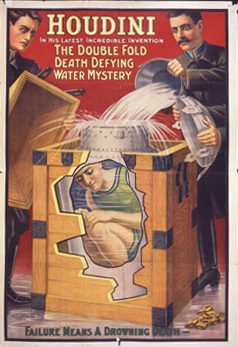 The Double Fold Death Defying Mystery was an enhanced version of Houdini's Milk Can escape. After being locked in the water-filled can, the can would then be locked inside a large wooden chest. According to Bill Kalush, the chest still exists and "the craftsmanship is beautiful." A photo of Hardeen performing the escape can be seen in Christopher's Houdini A Pictorial Life (page 54). "Sheffield Entertained" runs through May 6, 2013. Click here for the exhibition location and hours. For more information visit the news and events page at Sheffield University's National Fairground Archive. Exhibition flyer (click to enlarge). UPDATE: Houdini's Double Fold Death Defying Mystery at auction. Since the chest still exists, where is it presently located? Is there a photo of it somewhere? Afraid I don't know where it is. Probably in a private collection. Bill Kalush mentioned its existence when he lectured at the Skirball. But I feel like I have seen a photo.